So you are looking for a homemade wine recipe to have an idea of what you are getting into. You don't need a recipe to make homemade wine, not in the same way that you do when cooking a particular dish. 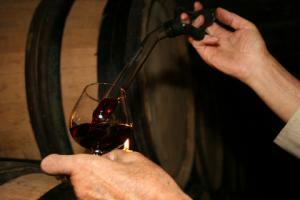 While cooking ingredient and techniques vary widely, this is not the case with home made wine. The techniques do not vary so much, and neither do the ingredients. Sure, making red wine will vary a bit from making white wine; and making wine with pinot noir grapes will give you a different flavor from wine using zinfandel grapes. But these wine "ingredients" call for similar techniques. The recipes do not vary as much as when you are cooking, for example, chicken enchiladas and roasted turkey. Here is a recipe for wine made with zinfandel grapes. Enjoy! Crush and destem grapes. Add 0.44 grams of potassium metabisulfate to the crush and stir. Measure sugar . The sugar levels before fermentation should be around 25 Brix. Cover container and let stand overnight. Next day dissolve a packet of wine yeast in warm water. Water should be between 94ºF and 105ºF. Stir into the crush along with about 5 grams of yeast food and oak powder. Check for signs of fermentation such as foam or gurgling noises. Gently punch the the cap of grape skins down into the juice twice a day until fermentation begins to slow down. Continue to check for sugar levels. When Brix is near zero press the mixture of juice, grape skins, seeds, stems. Fill carboys and add malolactic bacteria, let them stand at room temperature. After about a month, rack wine onto clean carboys. During racking add 1.5 grams of potassium metabisulfite to clean carboys. About a month after the first racking, check your wine against a bright light for clarity, color hue, and dissolved gasses. Do a second racking, adding 1 gram of metabisulfite to clean carboys. Continue to rack wine about a month apart, each time adding metabisulfite to the clean carboy. Do this 3 or 4 more times. 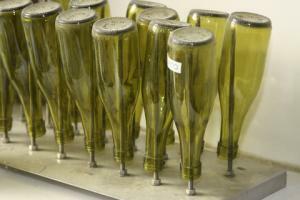 When wine is clear, it is time to bottle it. Allow it to age at least 6 months before drinking. You can use the same elements and techniques, with minor adjustments, even if you are using a different grape. My advise is for you to buy a couple of good books on making wine at home. They will tell you all you need to know about adjusting components, testing, measuring, and tasting your wine. Your brew shop will also offer a wealth of information. They will be your source of supplies, equipment, and knowledge.